London Freemasons are donating £2 million pounds towards the ‘Your London, Your Helicopter’ campaign of London’s Air Ambulance which aims to provide a second emergency medical helicopter for use by London’s Air Ambulance advanced trauma team. The aim of the second helicopter is to extend daylight flying hours, thus providing an even more effective emergency service to London. 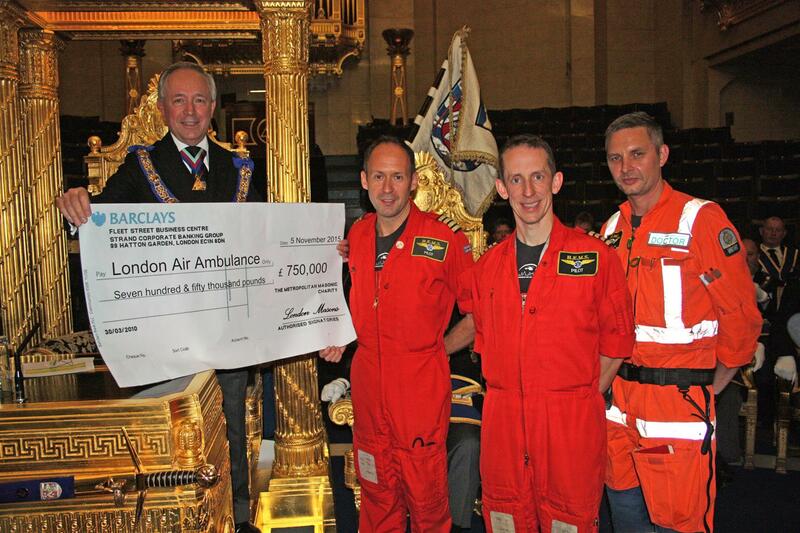 The Freemasons’ fund-raising campaign kicked off with the presentation of a cheque for £250,000 at Freemasons’ Hall on Thursday, 5th March 2015 to Neil Jeffers, Chief Pilot of LAA, by the Metropolitan Grand Master, Russell J. Race, DL. Russell Race commented, “Freemasons both in London and all over the country have been donating to Air Ambulances for many years. We at the Metropolitan Grand Lodge of London are delighted however to have an opportunity to specifically assist in the provision of this vital second helicopter for London”. This first instalment was followed by a further £750,000, which was handed over by Sir Michael Snyder, the new Metropolitan Grand Master, on Thursday 5th November 2015. London has now reached the half-way mark in the appeal after just 8 months. As you can see below, The Freemasons of London achieved their goal and this week the new Air Ambulance became operational. This is an amazing achievement by London Freemasons, well done to all!! !